Hmm - how could a scrapbooker use it? You know, somehow I picture a cute baby sitting in it with legs poking out either side with pin cushion for a little pillow (sans the pins of course)... All strapped to a cute trendy mom. 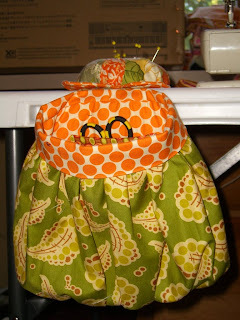 You should think about designing a pattern for fashionable baby slings/pouches. Very clever! Cute and useful--great thinking! OK you two have really outdone yourselves with this bag. It's adorable. 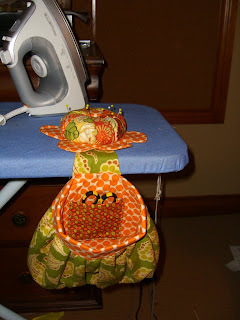 Every quilter needs one of these. I cant wait to get the pattern. 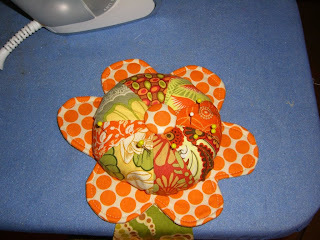 I saw the sample at the ogden utah guild fair. I was impressed. Let me know when it is available.